Many thanks to the Antiquarian Librarian for posting this wonderful list! Feel like going to the library but not leaving the comfort of your home? Check out these iconic film scenes from Beauty and the Beast to Ghostbusters, all of which take place in the library. My personal favorite? Breakfast at Tiffany’s. Sometimes it seems like what is inside books gets all the attention -check out The Book Cover Archive for some book cover appreciation! 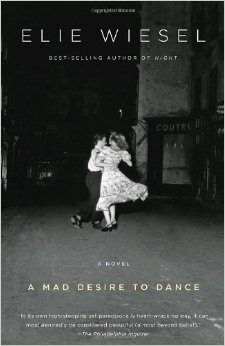 My personal favorite: A Mad Desire to Dance, by Elie Wiesel. Check out Huffington Post’s list of the 18 most hipster books of all time and find out! Looking for book recommendations? Look no further! Nancy Pearl, perhaps the only librarian modeled into an action figure, walks you through some of her favorites in this NPR interview from December of 2013.